With the dark months rapidly approaching, it’s time to reflect on the year’s racing. Usually that means what we messed up and what to do to iron things out for next year. Most of the time, little or no credit is given for what was accomplished. But a little discussion at home recently brought to my attention that the last 15 months or so had really gone rather well for me regarding my sport/hobby. Given my history of injuries and having been written off by the medics on more than one occasion, it was wonderful to enjoy this period with little more than a few temporary niggles. In 2013, I competed as a GB age-grouper at Sprint distance at the European Champs (Turkey) and World Champs (London). 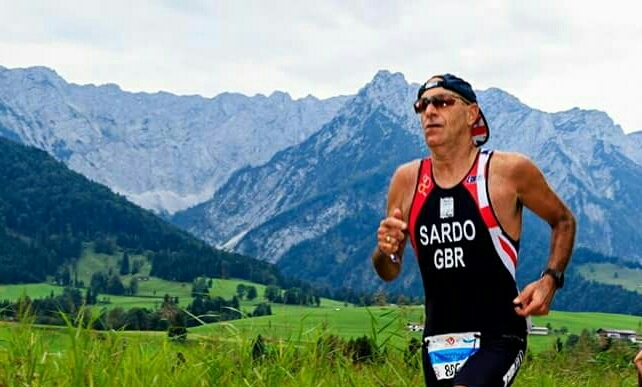 2014’s qualification for the Olympic distance at the Europeans, had to be surrendered weeks before the event due to injury which would last the whole season. So last year my aim was GB qualification at other distances too. 1) The first step on this new journey started in June ’15 at Grafham Water which hosted the English Middle (half iron) Distance National Championships. This would be my first full race at this distance (an attempt at the ‘half’ some weeks earlier at Bala, Wales, was cancelled near the end of the bike leg when a competitor tragically lost his life). The unloved swim was tempered by having 2 laps with swimmers leaving the water after lap 1, running a few yards and then re-entering for another lap. Despite this, as usual, my bike looked very lonely in my Age Group section of transition! A good bike leg in mostly heavy rain then followed before 21km of extreme back pain on the run. My son Luca had come over from Bath to join me for the weekend and having him cheering the old man on during the run and transitions was just brilliant! And having him with me when the results were announced – National AG champ!! – and the thoughts of how the medics had kept telling me “forget it; no more”, left me with more than a few little tears behind the cycling sunnies! Although I had won my AG at a small number of events in the past, they were sprints/standards, not at Half Iron distance and certainly not at the National Champs! 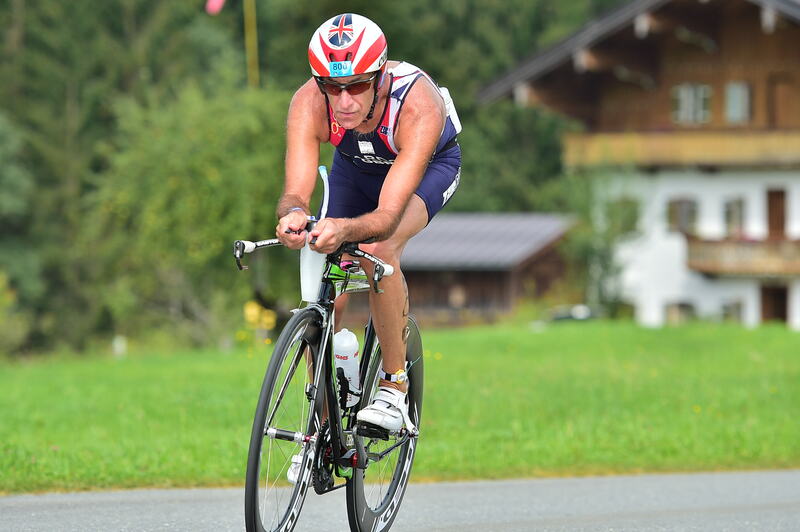 2) A month later, we were in Geneva in scorching 35deg heat to race the European Sprint Triathlon Championships which I had qualified for over a tricky course in the Peak District. We drove down and spent a few days in this lovely city. As always, this was a noisy, colourful and cosmopolitan affair with much going on, loads of GB supporters, top elites (a chat with superstar Xavier Gomez!) and closed roads around Lake Geneva and through the city itself. My result of 11th in AG (3rd out of about 18 GBs in AG) was similar to my previous European Sprint experience which left me a little frustrated although I thoroughly enjoyed the race, the venue and the whole experience. 3) Early this year I was lucky enough to have my name pulled from ATC’s hat to win a place at the London Marathon. A marathon was not ever something I had my eye on because of my ‘glass body’ and I was reluctant to risk all the triathlon ‘fun’ by tackling the training required to do well over 42km. But now, with an entry to London on a plate, I couldn’t turn down that opportunity and I put my mind to training for this new experience. The aim was to do as well as I could….perhaps try for a ‘Good for Age’ result and not merely to finish it. Oh, and to remain uninjured. 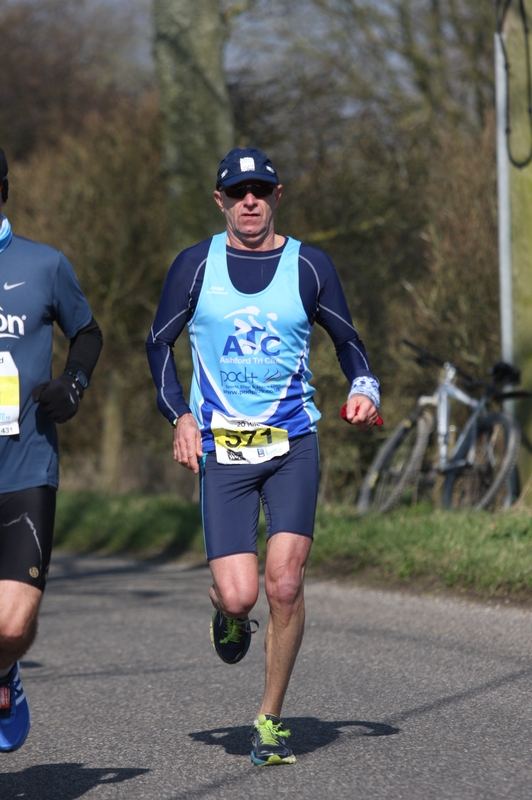 Part of the build-up included the Headcorn Half followed some weeks later by the Lydd 20 miler, both in the company of several ATC clubmates. This was the first time I had raced these distances too and both went exactly to plan at 1:37 and about 2:45. All good so far. An offer to join the A&D coach to the Greenwich start was greatly appreciated. It was generous of them to open the coach up to ATC too and great for me to have the company and all the advice on offer from the experienced A&D folks on board (although at the time all I needed to know was where the loos were!! Nothing could have prepared me for the atmosphere along that course. 42km of constant wall-to-wall noise. Nowhere on the route was ‘quiet’. Yet I’d been warned how ‘easy’ it is to get carried along by the cheering supporters from the off and then be overcooked by the time we get to the Cutty Sark. On the other hand, my little brain kept reminding me of certain ‘jibes’ by some ATC mates about Sprint tris vs marathon and also about ambitious target times which the KE had printed in an article that week! Childish I know, but I have to admit by the time I reached half way and was still consistently clocking 8min miles, I was being driven by the memory of the ‘jibes’ to continue at that pace! As it turned out, after I had caught up to the 3h30 pacer at about 4kms, he would never be more than an arm’s length away and I was ecstatic to complete my debut marathon in 3h29m, earning a ‘Good for Age’ place for 2017 by 15 minutes in the process. Everything had gone exactly to plan and all the body had held out. Absolutely loved it; thank you ATC! 4) A few weeks later, in early May, Luca again joined ‘the old man’ in Copenhagen, to race the European Long Distance DUATHLON Champs, my first duathlon as GB age-grouper. We spent a few days in a waterfront apartment close to the start/finish/transition. Like the ‘Grafman’ Nationals some months before, it was good to spend time together, and to have his help and support. My focus on London marathon since January, however, meant some neglect of the swim/bike training and I wasn’t as prepared on the bike as I’d have liked to have been for this race. So after a good first run, I had to work really hard on the bike to try to ride as I know I should, but this took its toll on the second run which was a frustrating and painful affair. The final result was a 4th in AG and 1st GB home, the best I’ve achieved at European level. But again I was left frustrated knowing that had I cycled as I am capable of, it may well have been that elusive podium. Lesson learnt! 5) Lisbon was the venue in June for the European Olympic Distance Triathlon Champs. Lynn and I were joined by family of mine living in the Algarve who came up to help make some noise. A swim in a protected harbour, followed by a 2-lap bike course on closed but exposed motorway and a packed and spectator-friendly 4-lap run along the promenade past bars and restaurants and a great indoor arena finish, made for both extremes: the most enjoyable weekend of Championship racing and fun to date, as well as the ‘worst’ European result! (15th in AG and about 5th GB). Maybe too many Portuguese custard tarts with the family…..!? The bike was a magnificent, scenic and hilly 2 x 45km lap race which kept cyclists alert all the time….no boring mile after mile on the bars here! Was also such fun taking back 24 places I’d lost in the swim. The run, a gorgeous 4 x 5km laps around the Walchsee lake, was extremely difficult because of the high temperatures by then but mainly for me the old ‘back issues’ returning to haunt me. Despite this, I would haul in another 3 competitors by the time the red carpet appeared, to come in 10th in AG and 2nd GB home. Only 2 GBs in top 10 and being one of those helped confirm my National win result from 2015, in my little insecure mind! Everything about the race went as well as I could’ve hoped for. For me a solid result, an awesome setting, brilliant supporters, great organisation and racing over an exciting course….and all without technical incident. So from June ‘15 to September ‘16, we’ve had GB representation at 4 different European Champs: Middle Distance, Sprint and Olympic triathlon and long course Duathlon. Also a National Championship triathlon win and a debut marathon at 3:29 in ATC colours. Some of these European results mean there is ‘automatic’ GB selection to the same European Champs (long distance duathlon & middle distance triathlon)for 2017, as well as London Marathon. However, there are still decisions to be made about next year. It took a month in hospital with a broken leg and other serious back/shoulder injuries following a hit & run while cycling, to get me started in triathlon 5 years ago. That and the prognosis that has been dished out to me so often, makes me so thankful and blessed for every step I am able to take and enjoy. I am so aware of how important our health is and how fragile our lives are. I love the competitive racing, especially competing abroad and I love the welcoming and supportive triathlon community. We all have our personal stories to tell of our journeys and reasons for participating. I am grateful to ATC and the support of the Captains’ Fund as well as the support and influence of several members personally and also extremely fortunate to have the absolute support of my biggest fan, my long-suffering wife Lynn. Hopefully my little grandson, Joshua, will be inspired by Papa’s adventures to also get to understand the many joys and benefits that our sport and its community can bring, whether as a newbie or an elite or anywhere in between. I feel extremely proud, honoured and humbled to wear GB colours and would love to wear them on a podium at a European Championships sometime. Maybe next year……!